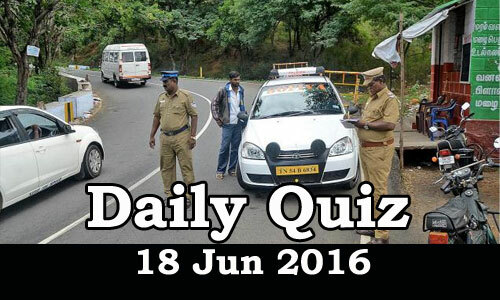 Daily Current Affairs Quiz 18th Jun 2016, Current affairs and GK questions on National and International are listed in the Quiz. Candidates those who are preparing for Government Jobs and IBPS/SBI/RRB exams and all other exams can use these questions. 1. The Centre has cleared _____ crore rupees for the makeover of Ramayana and Krishna circuits of Uttar Pradesh under the Swadesh Darshan scheme. 2. The NCERT is set to organise the first ever 'Yoga Olympiad' for all government and government-aided schools students ahead of the International Yoga Day on June 21. Who is the Director of NCRET? 3. Union Power Minister Piyush Goyal has said all the states have resolved to provide round-the-clock power supply to every household by March 2019. The Power Minister also announced the launch of the helpline _______ for redressal of consumer's complaints across the country. 4. Which state government has decided to invest Rs.1,000 crore over the next three years towards skill development recently? 6. The Eurozone has approved €7.5 billion (about $8.46 billion) in bailout funds for ________ , in what will be the first payment since 2015. 7. Which Indian former cricketer has been named the chairman of the National Institute of Fashion Technology (NIFT)? 9. Who has been named "the hottest woman in the world" by the magazine 'Maxim India' as part of its 'Maxim Hot 100' list? 10. _______ has been named the World’s Best Tourism Destination for 2016 by the 'European Council on Tourism and Trade' (ECTT. 11. According to a report by software security group Kaspersky, India ranks ___ in the list of hacked servers available for sale on xDedic. 12. Who won the final of Champions Trophy Hockey tournament in London?